Breeding stick insects is easy, because when you keep them in the right way they will mate and produce eggs automatically when adult. For most species mating is not even necessary, so you do not even need to keep a male! Females of these species are parthenogenic, meaning they can produce fertilized eggs without being fertilized by a male. Some species can do either with or without males. However, other species do need males to reproduce, without males they will produce eggs but those eggs will not develop into nymphs. An adult pair of Heteropteryx dilatata, the female is green and the male is brown. The right environment for breeding stick insects, is exactly the same environment as for keeping stick insects. 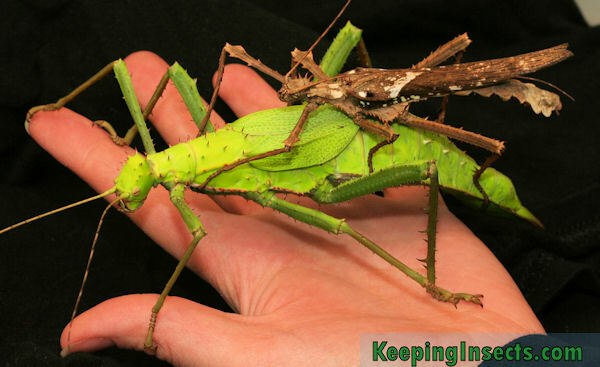 When you can keep a nymph from the first stage to adulthood, the stick insect will start to breed when it is adult. When males are necessary for fertilization, the male will mate with a female as soon as she is mature enough to produce eggs. After mating she will start to produce eggs. She will lay one to seven eggs per day depending on her species. Most species will just drop the eggs to the ground, but other species will stick it in the ground or glue it to leaves or to the enclosure (see Species for the habit of your species). Once fertilized, a female does not need to mate again. She will stay fertilized all of her life, although re-matings can occur and are not harmful. Eggs of Extatosoma tiaratum. Every species of stick insect has differently shaped eggs. 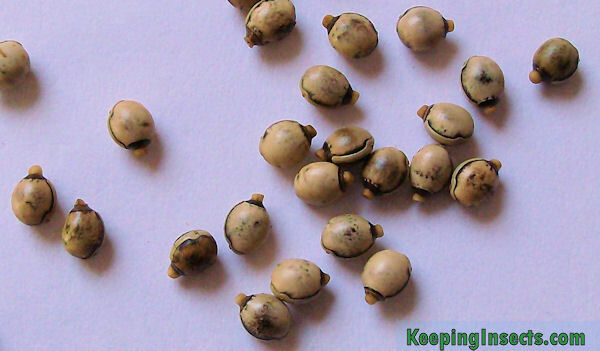 Taking care of the eggs is the hardest part of breeding stick insects. Eggs are vulnerable to adverse circumstances, like drought, extreme temperatures and fungi. Generally speaking, you need to keep the eggs a little bit more moist than the parents need to be kept. You can keep the temperature the same as the temperature of the parents with a maximum of 30 degrees Celsius. Keep the eggs in a small box with proper ventilation, but make sure any newborn nymphs cannot escape this box. The substrate you put in the box depends on the way the female places the eggs; when the female puts the eggs into the ground you have to put the eggs into potting soil. When the female just drops the eggs to the floor, you can better use tissue paper as a substrate. Place the tissue paper in the box and put the eggs on top. Spray the eggs and the paper often, depending on the needs of your species. Make sure to let the paper dry completely for half a day before spraying again, as this is the best way to prevent mold. Mold is an absolute killer to your stick insect eggs. Adjust the ventilation of the box when you see that the eggs stay wet for more than 5 days after spraying or when you see mold. You have to be patient to keep eggs of stick insects; it can take between 2 and 14 months before the eggs hatch depending on the species you have. In all this time you have to make sure the eggs do not dry out and do not mold. When you are successful, you will see tiny nymphs walking around in the box. If you see this, transfer them as soon as possible to a fit enclosure with fresh leaves. Tiny nymphs can have difficulty eating from undamaged leaves. To make sure they have no difficulties, you can cut off the edges of the leaves with a scissor or tear them by hand. Placing an older nymph with the younger ones will also tackle this problem. This video shows a stick insect nymph coming out of its egg. It’s hard work! 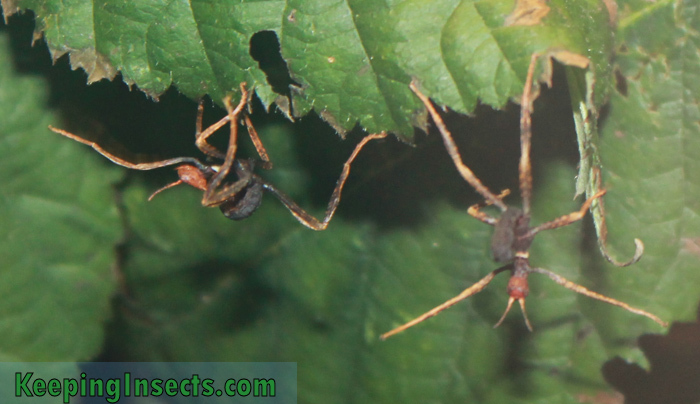 You can see the legs are still flexible because the exoskeleton did not harden yet. After hatching the skin will dry to the air and will become hard and strong.